is a Buffalo, New York sports club ... with a difference! Games begin with a commitment to SPORTSMANSHIP at center court. At halftime of each game, 10 minutes is put on the game clock and a HALFTIME HUDDLE takes place at center court. HALFTIME HUDDLES involve areas of physical, social, mental & spiritual development. All games end with a HANDSHAKE LINE. Our COACHES are required to be examples of good conduct, especially when dealing with referees, players and opponents. Youth Advantage is affiliated with the Wellness Institute of Greater Buffalo & Western New York. Cost: One-time Player Registration Fee - $25/player. PLUS $5/player/game or $50 one time payment. Checks payable to Youth Advantage. #2: Download Player Registration Brochure from this website's FORMS & BROCHURES page. Please include $25 Player Registration Fee with Player Registration brochure mailing. 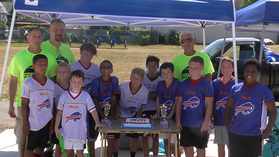 See the Youth Advantage NFL Flag Football page on FACEBOOK! Questions?? Call League Commissioner Christopher Denny @ (716) 697-6659 or YA Director Russ Kingsbury @ (716) 602-7546. Youth Advantage will be conducting the following basketball programs in the Spring of 2018. #5.) PROCESS Basketball - Basketball training on Tuesdays & Thursdays @ 6:00 - 7:30 PM and 7:30 - 9:00 PM @ Baker Hall School in Lackawanna, NY. #6.) Easter Egg Classic 3-on-3 Basketball Tournament - Tuesday April 3rd & Wednesday April 4th @ Noon - 6:00 PM @ the Riverside Teen Center (Boys & Girls Clubs of the Northtowns) @ Nazareth Lutheran Church. Youth Advantage is registering three teams in the WNY Christian Basketball League - Winter 2017-18. Youth Advantage A-1 coached by Russ Kingsbury & Greg Fields. A team of mostly 9th-11th grade boys from various Buffalo & WNY schools (Riverside, McKinley, Orchard Park, JFK, Park School, Canisius, Alden & Depew). Youth Advantage A-2 coached by John Cusack. Coach John's roster includes players from Middle College, CSAT, Amherst Christian Academy to name a few. This team should be considered a favorite to compete for the title. Youth Advantage C coached by Aurea Espada. A tough group of 5th, 6th, 7th & 8th graders that will press, defend & attack the basket in every game. These players represent schools from all over WNY. All games are played on Saturdays at Trinity Lutheran on Reserve Rd. in West Seneca, NY. Teams practice at Baker Hall School on Tuesdays & Thursdays. To reach out to at-risk youth in Greater Buffalo & WNY, using sports leagues, clinics & camps to build relationships that will forever impact their lives. Call Executive Director Russ Kingsbury @ (716) 602-7546 (cell) or e-mail russkingsbury@wzrd.com.